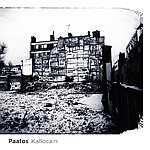 Review: "Paatos: Kallocain" - Sea of Tranquility - The Web Destination for Progressive Music! The "wintry" melancholic prog conventionalized by Landberk and White Willow first left its mark on our underground musical landscape roughly a decade ago. It didn't matter to a great body of listeners whether these bands were the originators of this style or not � to many, they were this style. The members of Landberk and another group called �gg came to know (and respect) each other by way of playing some dates together. These bands, as we know, folded and members of each party subsequently formed Paatos. The players in question would be drummer Ricard Huxflux Nettermalm and keyboardist Johan Wall�n from �gg, and bassist Stefan Dimle and guitarist Reine Fiske of Landberk. Nettermalm's spouse, Petronella, an accomplished choir singer and cellist, was brought in to sing on their '70s-evocative debut, Timeloss. Fiske left before the recording of Kallocain, and was replaced by Peter Nylander (a Berklee alumnus). Titled after a sci-fi novel by Swedish author, Karin Boye, the new album was mixed by Steven Wilson. Comparisons were quickly drawn to Portishead and Sigur Ros, but in the end this effort arguably has much more to offer. "Gasoline" opens with an expressive forty seconds of solo cello in the upper register by Petronella before the groove accompaniment manifests within the confines of a spacious, retro-mantled mix (yes, the overall make has not been completely 'modernized' by Wilson's hand). The lilt of Petronella's voice immediately captivates; she sings in English with barely a trace of an accent, which makes her voice sound even sexier. The minimalist vibe of "Holding On" capitalizes on the drone of the cello, sparse rhythms and low-key guitar, Mellotron and analog synth textures. The deliciously titled "Absinth Minded" (hold the e) will be a favorite with its wistful lyrics and hypnotic vocal. This and "Holding On" would certainly garner the band some attention in America if FM radio would oblige. Nylander's gently distorted, suspended notes complement Wall�n's spacey synth and harmonium tones to lend "Reality"a feel similar to pre-1978 Tangerine Dream, apart from the other instruments. "Stream" floats on a cloud of piano notes dispersed like cloves, the ever-present 'Tron and Dimle's earthy-sounding upright bass. "Won't Be Coming Back" sounds like another obvious choice for a single � a genuinely infectious melody lurks among the waves of retro-goodness. Kallocain will draw many fans of prog's heyday with Johan Wallen's vintage keytones and the calculated order by which these songs are crafted � Ricard Nettermalm's reined-in performance is nowhere near the true level of his ability. And then there's Petronella's voice, which makes this a logical gamble. The limited edition carries a bonus DVD of the band's performance on German Rockpalast TV.